Shhhh! It’s 5:30 a.m. Wanna see what I was looking at? With nothing happening at the condo this week, I’ve decided to jump the gun and post Week 21 of the 52 Snapshops of Life photo challenge. #52Snapshots is a weekly themed photo challenge hosted by #TLPB that anyone on social media can take part in by using either of the aforementioned hashtags. The theme is sky and as you guys know TW loves to photograph the sunrise over the upper NYC skyline almost as much as she loves to photograph ME. I give her the opportunity to witness this beautiful phenomenon since I like to look out the window when the sun is rising. 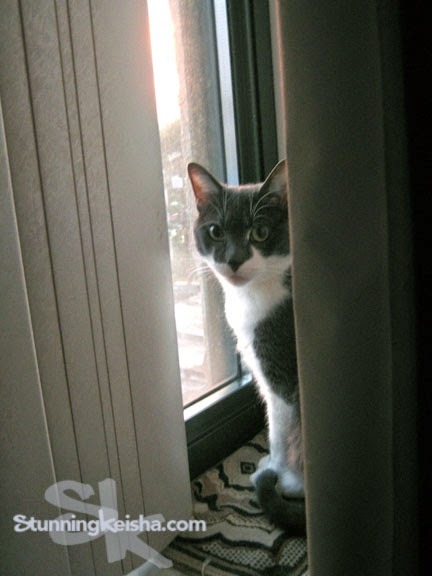 When she gets up to feed me, she takes a peek out the window. This is an early Spring sunrise as opposed to the August sky I featured last year. Let’s zoom in for a closeup or as closeup as TW’s cheap little camera can get. NYC has become “crane city” with all the new hotels and luxury highrises being built. I know y’all have pretty sunrises so I hope you enjoyed ours. I’d imagine each is a little bit different, just like George’s cats. Does your peep go ga-ga over the colors in the sunrise too? PS: Don’t tell TW but I’m actually watching Car-tv on the helix. The cars look like little toys that I can play with. 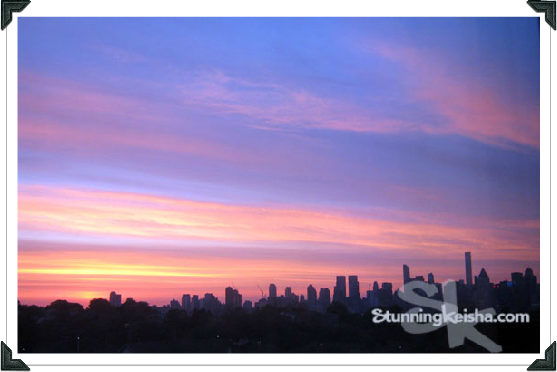 CK we love TW Beautiful sunrise photos of the skyline of NYC. There is a NYC based photographer we follow on Twitter who also does some fantastic NYC skylines too. That is some pretty morning view CK, but you are the Stunning One! just beautiful! i have cousins that live in NY with a gorgeous view of the city and I believe the Brooklyn Bridge. It's unreal! I love the views you and your family get and were I your mom I would also be taking those pictures as often as possible. Those are beautiful sunrise photos. Yes, Mom and Dad go ga-ga over sunrises too. I am impressed....this is the most beautiful sunrise over NYC that I have ever seen. This city must be massive. Thank you for enriching our lives my friend. Those are great photos. Truthfully, I prefer to be indoors so I don't really look at sunrises or sunsets- I know I am pathetic. Wow!!!! Have a delicious week! The sunrise photos are lovely. My mum likes to take sunset photos. Even if my mum is awake early enough for sunrise, her eyes haven't opened enough to see it. There are cranes EVERYWHERE in NYC! It's crazy. Those photos made my human homesick for New York. She's always felt more at home there than in L.A.
Great pics! My momma are a sunset girl, she usually sleeps through sunrises. What a beautiful sunrise! You are so lucky to get such a gorgeous view! That's a beautiful sunrise, CK. We hope you woke TW up to see it. That sky is right purty, TW! Thanks for sharing your beautiful sunrise with me. The chance of my human seeing a sunrise is close to zero....she's a night owl. That is a beautiful sunrise. We don't see the sunrise here so much, our house faces west so we only see the sunsets. And ours are totally different since we see mountains instead of the city. Even though I'm a country girl, I think the city can be beautiful as well. 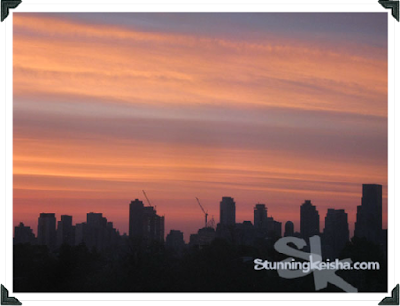 Very nice skyline pics. We like to watch sunrise on our morning walks. Gorgeous sunrise photos over one of my favorite cities! Lucky you!! What a view! !